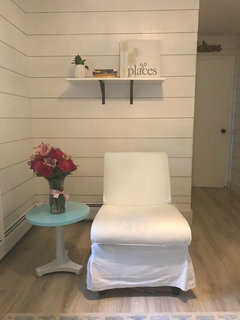 What design advice do you have for my therapy office for teens and young woman ? I love these comments. Also directly in front of the white couch is a white chair I sit Ina door a shelf above me with books and art work. The armless chair is for overflow or parents who come check in as I mostly work with individuals. 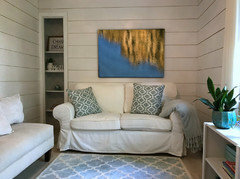 Love the idea about the art work above the sofa and I do have a coffee table - small - now but love the idea of the ottoman. Your comments mean so much thank you! Any suggestions to replace the tan loveseat? I have another armless chair identical to the one I sit in but the girls like sitting next to each other. I know this because I had other single seats and they bypassed those to sit on thAt loveseat ! the tan piece will work, unless you want to get an actual sofa for the spot. this pic one actually has some good design elements in it too!. (picture/table, plants) but the sofa is small, yet soft and comfortable for more than one person. the last one I like for your space. they are all nice, but the last one seems more tranquil and soft. 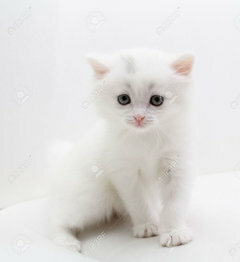 has more white. 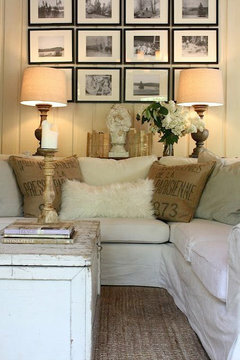 use the white frame or try a reclaimed wood/driftwood tone wood frame w/white mat. Check Etsy for the art. they have some wonderful artists on there. I'd do a watercolor. 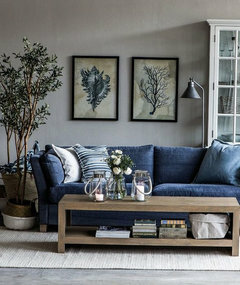 Would you consider removing the beige sofa and putting the white one in its place? 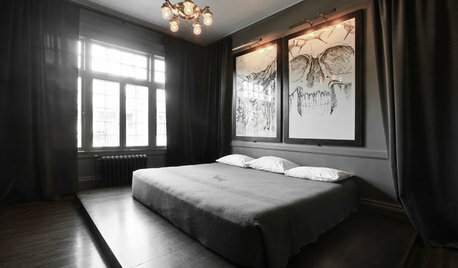 Then get two matching chairs, one on each side of the window, so you and the clients can face each other. A round ottoman/table in the middle. Maybe paint the room a soft, soothing light blue. A pretty painting instead of the mirror. What is outside the window? 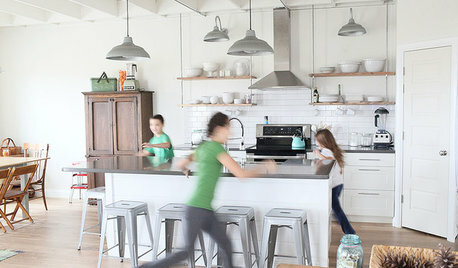 A white shutter on the bottom half would still let light in while providing privacy. 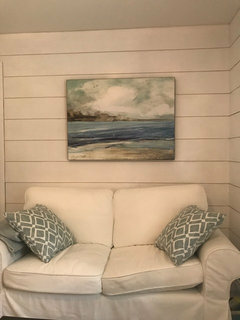 The blue and white gives a beach look so maybe some shells on the pretty shelves. I was going to say to add a fish bowl. I find them to be calming and peaceful. Hi Susan I will take photos tom of what is across from the white sofa. I sit directly across from it in a white ikea armless chair. The beige sofa I never sit in - only a parent when they check in. I operate my business out of a separate wing of my house so the view is trees and birds. It's very private! Def going to swap out mirror for art. 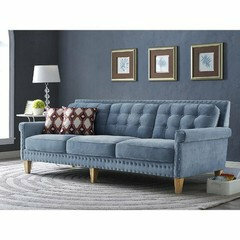 this gorgeous blue velvet sofa wouldn't hurt either! one more element....therapy kitten to match the room! the last art.. the canvas one.. the other one is a little rougher and doesn't have that calmness. 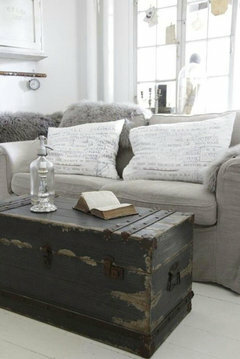 I love the idea of an ottoman or pouf would be great and would create emore more element of comfort.. I love to lean on a sofa edge with a blanket... I would feel comfortable in your space!! My only recommendation would be to change out the word canvases to other art objects. Word canvases tell clients what you want from them (e.g., believe, dream) rather than giving them the right to their feelings (e.g., alienation, despair). River stream yes!!!!! So true!!!! Well you need a coffee table for the tissues and a tray with water and cups. Pillows should be squishy and not look new or perfect (they will go on laps immediately and I don't want to ruin a too-perfect look!). 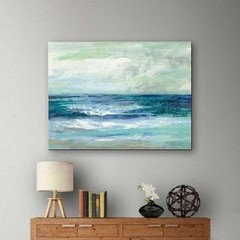 I like a calming look, but I want something in a strong color to focus on. 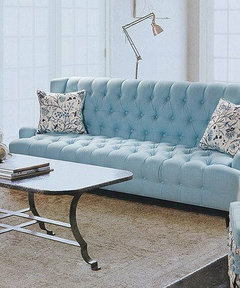 As much as I like the white sofa, it doesn't encourage me to put my feet up (or, in therapy-speak, to go fetal...) So a very very good faux leather sofa would be my choice. As dumb as it sounds, leather=worldliness to me. A tea set (or tea cup collection) would be lovely. Very cute. I would like to see a pop of coral (warmth) & the mirror replaced with a round version (good Feng Shui ;). Mirror frame feels a little blunt. Minor tweaks, GL. I have a coffee table not pictured - I would rather have an ottoman though. Tissues and a place for my sand tray - a must! I agree with you in the pillows. As many of my clients I have to stop myself from trying to make everything perfect - we all know there is no such thing! So a bit of dirt on the white couch (removable washable covers ) and some mismatch is ok ! jennifer, you need a better chair for yourself. something that you could tuck your feet under to get comfy. It would make me uncomfortable looking at you sitting straight and with no where to put your arms! If I see a therapist who is relaxed, tucks her feet under her and gets comfy, i'm going to feel a bit more relaxed in speaking with her. 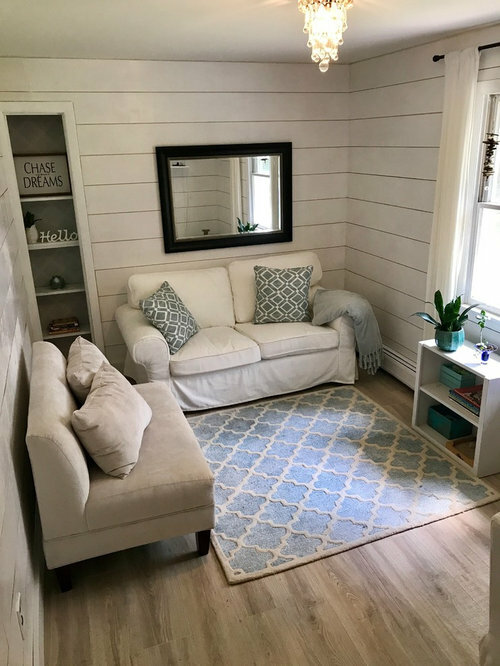 I was thinking the same thing as Beth H.
that corner seems to have enough room for a chair, similar to the love seat style, with arms. Pick something you like and can sit in for hours. Instead of the mirror, add a picture/large photo of the water. Very calming and grounding. Isn't that an Ikea Ektorp sofa? They do a chair, too. Would that fit angled? I would get a cover from here, though..
And yes. The mirror. I would prefer to see a calming picture there. I don't want to see my worried face or red-rimmed eyes. I'm speaking purely from a patient perspective here...I'm thinking of those kind of places that I loved to be in....I do love the sofa. I love the coziness of the space. It feels friendly. I would feel secure but not claustrophobic, which is what I think you're looking for. You should have a chair to sit in. The sofa in my opinion looks flimsy and uncomfortable. I wouldn't know where to sit in that room and it would probably end with me walking out. Some people like me have bad backs and nothing in that room looks appropriate to sit in for someone with back issues. Also, rule #1 of office furniture, no skirts on furniture. They will be destroyed in 2 months. Honestly, I'd change out the mirror for a painting and leave the rest exactly as-is. The space looks calm, safe, comfy, clean, and a lot more inviting than most waiting rooms. As far as the painting goes, perhaps a forest scene or some other representation of nature. Also, I don't see any magazines, not that I'm not sure you need them. When I wait for the dentist or doctor, I usually mess with my phone instead of rummaging through the old copies of People. Still, a waiting room without magazines looks... different, and in kind of a good way LOL. 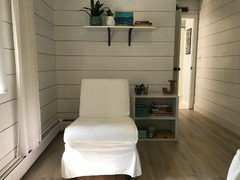 Oh, wait... this is the actual therapy room? Well heck... OF COURSE no magazines. Sorry about that. I surely understand about the shiplap. Maybe pick up some contrast color in pillows, rug, and picture. I also liked when you said not wanting to sit higher than your clients... I'm a teacher working with kids grades 3-12 who have serious reading deficits. I never, ever sit authoritatively behind my desk. I pull up a chair and we all sit and work together at a big table .. Your office is lovely. I would just add some color. Some have suggested an ottoman, but I suggest you leave it that way. A piece of furniture in the middle could create distance between you and you patients and it would make the room look smaller. I have to say, it looks absolutely beautiful the way it is. Since the mirror has already been pointed out, I agree with those who suggested a painting. 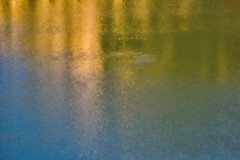 I would go for something abstract, like a watercolor painting like the one Beth H. posted. 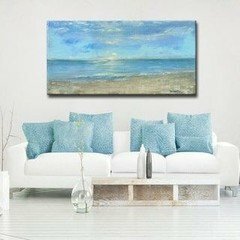 A subtle pop of color would also look nice on your walls. Thx you Susan and I hope you have a wonderful school year! Thx nr - I'm so uplifted by the kind comments. Warms my heart. I def will replace the mirror! Have a great night! I notice that you are inspired by nature. 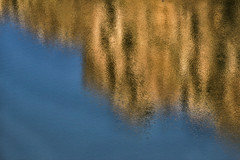 I have two abstract water images in my collection that may work. 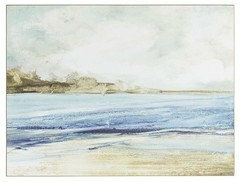 They are available in 20"x30" prints that can be framed. The metallic print option adds a nice sheen and depth. 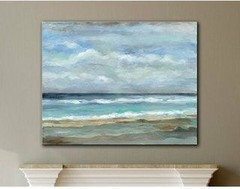 Paradigm - This one isn't listed on my site yet, but I can add it pretty easily. I'm not sure that this would work, though, as it always makes me feel sad. :-( Melancholy feels more introspective and calming. Blue stone gorgeous - thx you for sharing! I'm INTJ, i speak my mind. Honestly, but never to hurt. As a recently retired health care professional I have a few thoughts about the room. 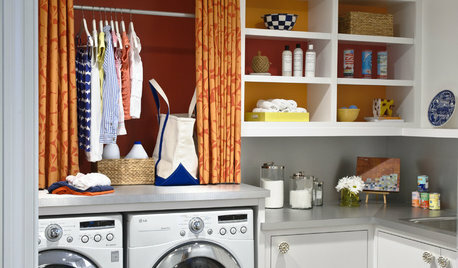 To me it feels generally restful, pretty and welcoming to the specific clientele that you are seeing. If children or blue collar workers on their lunch break were seeing you ...not so much! I think previous suggestions re. word art and art in general are to the point i.e. keep it pleasant but not directive. Some people do have phobias or traumas related to water, animals etc so less literal art is something to consider. It seems to me that you have given lots of thought to the clients and not enough to yourself! As they are here to see you for the benefit of your professional expertise, you are actually entitled to be considered with the same consideration as you afford your visitors. With this in mind I offer you my experience... 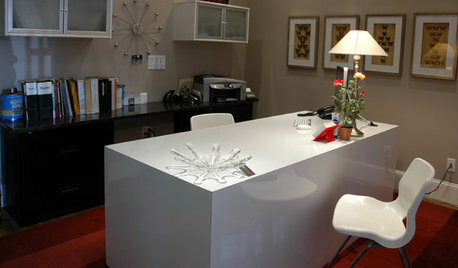 I had 2 offices in my workplace- one for quick visits & checkups and a second for the longer, more detailed visits. In "quick visit" Office #1, I didn't want anyone (including me) getting too cozy as the purpose of those visits were more goal oriented than exploratory so the decor and seating was more functional. Office #2 was the "sit down and work stuff out" office. To really pay attention to someone else you need to be comfortable, so I found having a very comfortable chair that fitted my body well allowed me to relax and settle into an intentional frame of mind so that I could focus on the client(s) during the longer visits, sorting out significant issues with each other or me or anything conflict resolution oriented etc. I usually charted between visits, and found a wide chair arm (wood in my case) helpful for writing. Once you move or leave the room your train of thought can be interrupted and the narrative becomes less contemporaneous, so this did work well for me. Anyways, you seem very sensitive to the needs of your people and I am sure the space will evolve as you go forward- best of luck! Definitely get rid of the mirror. Teens and young women are already usually struggling with body image issues. Would have a glass top table (that won't get stained) where patients can put their water/coffee/ etc plus tissue box. Plus maybe table space for drawing/art if you do that with your teens. 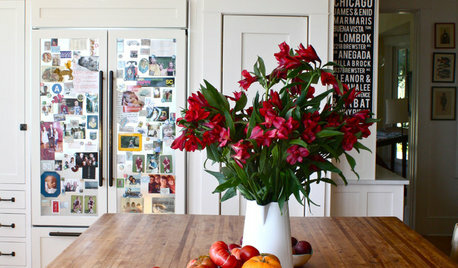 Tall plant in corner will warm up the room since it seems a little sterile with the all white. Please no potpourri or essential oils. Many people are have allergic reactions to this type of thing. I was wondering if you also see male teens..or is your practice dedicated only to females? If you do have male clients, I think I would try to interject more rustic less feminine pieces. I think a coffee table would be a good addition as well..do they have water bottles and items they would like to place somewhere. To create a more conducive space I would pull your chair in closer and place the bookcase that is under the window under the floating shelf. Instead of one large piece of art, I think a series of prints (travel/buildings/nature) will be interesting and something for the client to consider/enjoy before you are able to see them. If you practice after it gets dark, I think a lamp for low light is important. 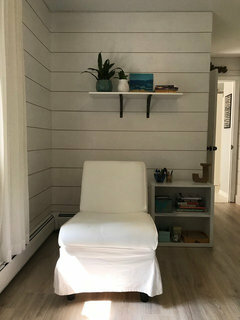 I am in the process of making changes based on some of the groups suggestions for my therapy office. Here is the book I sit in - across from my clients. Any suggestions on how to ground this side? 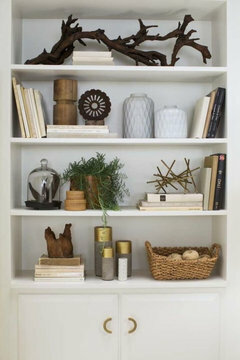 Does the shelf(s) look to cluttered? I'm going to keep my chair for now until funds allow and eventually get a new one. I would love a suggestion if someone has. Air bath or Whirlpool? Is chroma therapy worth the extra money? Help! Office/Sitting room nightmare. Need advice!